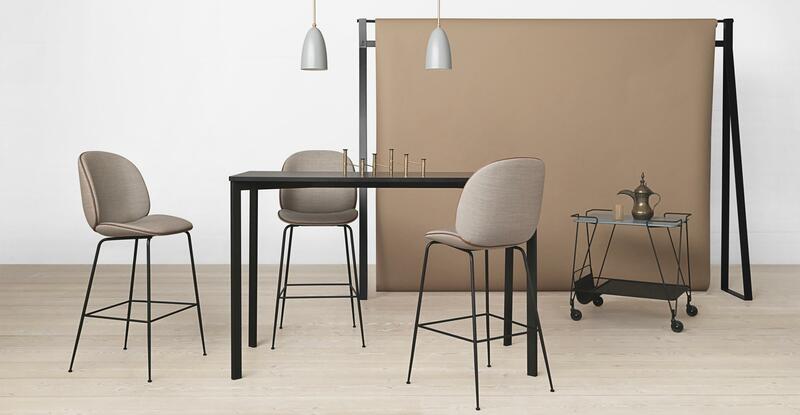 Simple, light and notably durable, the Beetle Counter Chair - Fully Upholstered features the characteristic elements of the beetles’ sections - shape, shells, sutures, rigid outside and soft inside. The height of the chair contributes to its light expression, which makes it blend into any interior naturally and with grace. Available in a black, brass, or black chrome steel base. Built of a solid steel frame milled into two plastic shells covered with an upholstery of your choice. Piping detail available in black or cognac leather, or matching upholstery.